Although the hoax involving the Cottingley Fairies Photos, circa 1920, is well known, many are unaware that one of the girls involved insisted that the 5th photo was genuine. As you will see in the 2009 video from The Antiques Roadshow below, Frances Griffiths admitted to the deception in the 1980s, along with her cousin Elsie Wright, but she always, to her dying day, said that the 5th photo was the real deal. In photos 1-4, the girls both revealed that they used cut-out artwork from Elsie and stuck them in the ground with hat pins. When you look at them now, that does seem pretty obvious. However, the last photo seems to have a different quality than the previous four and there are some hidden faces in that photo as well. 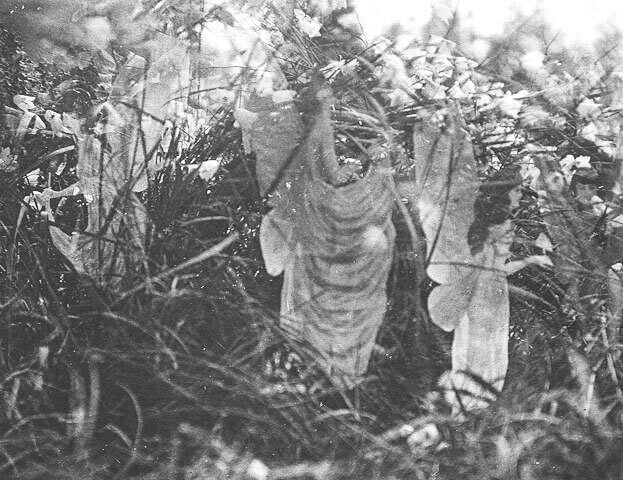 Here is a copy of the 5th Cottingley Fairy Photo so you can get a better look at it. Frances claims that the girls were not prepared (with cut-out images of fairies) prior to taking this photo so she looked around, saw some fairies making a sort of nest and sunbathing, aimed her camera and took the photo. It’s fascinating, but I can’t say that I am 100% convinced as much as I want to be! Still, it is certainly intriguing to think about. If you look closely, you will see some faces peeking through on the right side of the photos and bottom right below the fairy’s dress. When they showed themselves about nine years ago there was a slight drizzle around. I saw three fairies in the woods and I have never seen them since. They were just about ten inches tall and just stared at me. There is no way the Cottingley Fairies is a hoax. If you look at the picture in the grass on the right, you can see a very real face. I always loved this story. I read through so many articles and watched so many videos. The photos always seemed fake, but the fifth one seemed so vivid. I agree with the forester. After being hounded about it for all that time, it’s only natural that a “confession” would finally emerge. And, the pics that we see on the internet were highly touched up, to make them look fake. The Sir Arthur Conan Doyle site shows one made from the original negative, and it’s not nearly so clear. This can be seen on the “Grey Magick Forum” on Web.com. You could be write about the Internet photos.My Father had copies of the original plate photos. He grew very interested in these fairies and it was through this he did a radio program in the 1960s which was broadcast on the regional BBC now defunct Home service. The ro game being the North Countryman.Its strange that some years later a film was made about it and a lot of interest rekindled. It’s sad to say that there were a lot of inaccurate things about the film.The film of course was made in an area which was no where near the real place. I lived not far from Cottingley and it’s surprising what you learn. Sure, they are real. In Centreville, Virginia which is right outside of Washington DC, I encountered them. I was in a house next to a woods with a creek which I think is key. Running waterway and woods. They came all the way into my house and tickled me in the neck. I woke up swatting and swatting at them to get them off. They were singing to me saying “You can’t find her because she’s a man….” These are such high dimensional beings it’s said way cool…Not all little fairies are good, there’s said to be some evil one’s that have 4 wings and not the navigation abilities of fairies or bees who I heard fly by frequency vibration and only have two wings, the evil one’s have human bodies and wings to fly and the same size but sort of a cannibal parasite of some kind. Some kind of force that doesn’t want people to know about fairies must have manipulated the fakes to have a way to pass off the entire thing as fake. Mixing lies with the truth is nothing new but it’s everything everywhere. I don’t know what this world would be like if no deception occurred, it’s so deep like this place doesn’t exist without it for this could be it’s entire purpose. I was just introduced to the Fae by a reconnection session with two healers. I saw the faeries outside of a tree where my friend has his spiritual shop, the faeries took me inside the tree and we went up the tree in a spiral upward motion it was beautiful inside lots of white and other colors I had never seen kind of like aqua and luminescent lights all over with glows that opened up to further places in the tree kind of like a portal. When I came back from the meditative state I told my friend the healer about the experience and he said “I think this is a message for me” because he had never liked the tree in the front of the shop but he had done a blessing ritual on the tree a few days before my experience. Well needles to say, I am in love and very curious about the Fae, I made a beautiful fairy garden in front of my house where a huge tree is and I put tiny lights and furniture and fairies. Last week my husband and I went for a walk with our dog and as I was briskly walking I saw something move near a huge rock but I didn’t really bother with it, then again so I turned to the side and there it was a tiny peach colored fairy walking and I was like “omg did I just see a fairy?” but didn’t say anything to my husband I just kept walking then I stopped abruptly because a little wild bunny went running almost in front of me. Three days later I go to a class about cleansing crystals when my friend the healer asks me to make an offering to the faeries because I’m the one who discovered them. So here I am looking for info and that’s how I came here. I’m so happy to know that they are real and that other people believe in them. Hi!, I’m Ella and have always believed in fairies,but now more than ever! I have recently encountered some mysterious (what I think is fairies) sightings! #1. Is that I was just sitting down on my porch swing when out of the corner of my eye on a leaf of a tree I saw a little flash of red light,nobody else was with me so it wasn’t someone’s flashlight and no cars either! #2.was we had lost our dog,and I remembered that if you give fairies something they will do something back.So I put out some stuff your website said they liked.And put it out with a note saying that in return they could bring back our dog,then we left to go put up signs.When we returned I checked my offerings and they were all gone!!!! right after I got to the house the phone rang and a lady said she found the dog!!! Weird right? Well that’s all!Oh I have one question how do you make a good fairy house? Well,bye! There is a face on far right 2/3rds of the way up with short hair but the facial features of a gray alien type, jet black almond eyes, slit mouth, almost no nose staring straight into the camera. Kinda creepy. Doubt those two girls were aware of Gray ETB’s in 1920. All these phenoms are related. Our science is not equipped to handle it from the Vedas to UFOs. Many I’m sure are hoaxes but that 5% ain’t. Most countries accept the events and label them mysterious. The US still plays the top secret game. Believe Einstein solved the Unified Field Equations in 1927 but for good reason, the insane state of mankind, kept it to himself and a few others. The link between gravity and the electro-magnetic forces has all the answers. Not too difficult to work out if you are approaching it from outside the box. Frances maintained that the fifth photograph was real. However, Elsie maintained that it too was a fake. 100% real of the fifth photo I have claimed to see them as well the faces are real as the girls had nothing prepared that Saturday after noon because they already used the first four fakes because they admitted. That is also consistent with what Frances insisted was true.